The awards ceremony was chaired by the Commissioner for Digital Economy and Society, Mariya Gabriel together with the Mayor of Cluj-Napoca, Emil Boc and the Minister of Communication and Information Society of Romania, Alexandru Petrescu. StartUp Europe Awards is an initiative of the European Commission’s Startup Europe initiative and the Finnova Foundation. have been awarded as the best startups in the 5 different categories focused on social impact. The ceremony was celebrated in the frame of the Startup Europe Summit 2019, organized this year by the Romanian Presidency of the Council of the European Union as part of the Presidency programme in Cluj-Napoca. Cluj-Napoca, 21 March 2019. 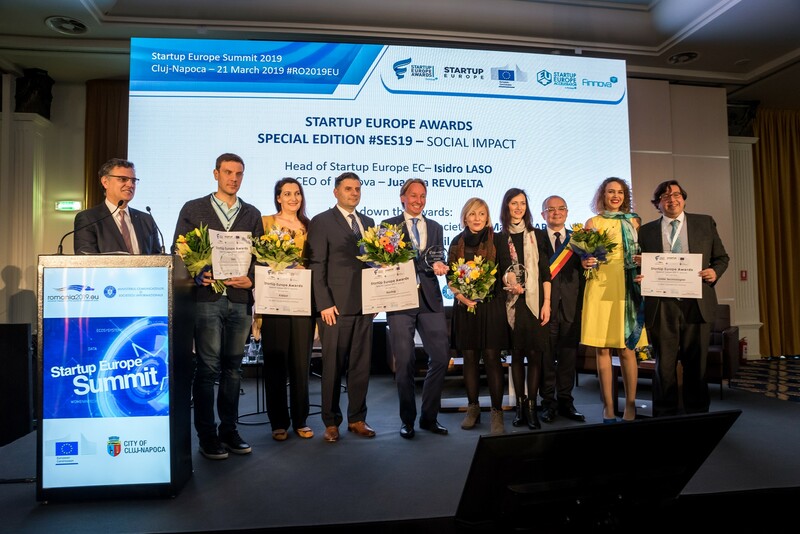 StartUp Europe Awards, an open innovation initiative of the European Commission’s Startup Europe initiative and the Finnova Foundation, recognizes the best startups in 5 categories focused on social impact. The ceremony was chaired by the European Commissioner for Digital Economy and Society, Mariya Gabriel, together with the Mayor of Cluj-Napoca, Emil Boc and the Minister of Communication and Information Society of Romania, Alexandru Petrescu. “Start-ups are essential for the future of Europe’s economy, its technological leadership and its capacity to deliver a human-centred and sustainable development. Four months after the Sofia Summit, we are together again to further strengthen the European network of start-ups, investors and policy makers and to foster cooperation across the whole continent, including in the Western Balkans. I am looking forward to inspiring discussions and would be happy to steer tangible solutions regarding the many challenges they fase”, states Mariya Gabriel, Commissioner for Digital Economy and Society. “Hosting such an event in the heart of Transylvania, Cluj-Napoca offers us the opportunity to celebrate the boldness and innovation of the brightest minds in Europe. The future belongs to those who can see that talents are the resource for a better society. Nurturing them and offering opportunities to test and try their ideas is the way go towards the Europe of tomorrow, where courage and curiosity are used to do good, and to become better”, declares Emil Boc, Mayor of Cluj-Napoca. “Great to host under the Romanian Digital Presidency of the EU Council the StartUp Europe Awards Special Edition in Cluj-Napoca, a place that’s been gaining european recognition for encouraging young entrepreneurs, innovative ideas, adoption of new technologies in a manner that has been proven beneficial not just for Romanians but for all European citizens and SMEs”, states Alexandru Petrescu, Minister of Communication and Information Society of Romania. The most outstanding startups from the EU and neighbouring countries have been chosen out of 70 applicants through an open call for a special edition focused on social impact. The honored startups are: OKRA Technologies (Female-led startup) from UK; Bolt (Founder under 30 startup) from Estonia; NorthQ (UN Sustainable Development Goals startup) from Denmark; Kidibot (Social inclusion startup) from Romania;and Mama Organa (Job growth startup) from North Macedonia. Winning startupshave been promoting their projects and approach customers and potential investors during the summit in a dedicated exposition space. StartUp Europe Awards proposes a methodology of open innovation through the public – private partnership, “that works for the public entities to find a solution for its local challenges and for the startups to try its innovations in pilots supported with European funding, generating social impact for the benefit of the citizens”, declares Juanma Revuelta, Finnova Foundation CEO. Kidibot is an educational online platform for 6-18 years old, designed to motivate them to read and learn more, using fun, positive social pressure, contests with prizes, cognitive dissonance, local patriotism and many others. OKRA is an AI analytics company for healthcare providing an online platform that allows healthcare professionals to combine all their data in one place and generate evidence-based insight in real time – including predictions of the future – to save and improve human lives. Bolt (formerly Taxify) is a transportation platform from Estonia, which has become one of the leading ridehailing platforms in Europe and Africa in five years. They are focused on making urban travel easier, quicker and more reliable. Empowering consumer-led energy efficiency through intelligent data management. The one-stop IoT Platform transforms and enriches data from energy usage into complex analysis enabling operational and resource savings. Machine learning and AI continues to reinvent energy management.